LONDON--(BUSINESS WIRE)--According to the latest market study released by Technavio, the global e-sports market is projected to grow to USD 1,475.49 million by 2021, at a CAGR of more than 32% over the forecast period. 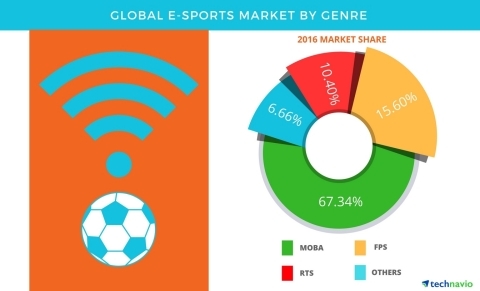 This research report titled ‘Global e-Sports Market 2017-2021’ provides an in-depth analysis of the market in terms of revenue and emerging market trends. This market research report also includes up to date analysis and forecasts for various market segments and all geographical regions. E-Sports is an attempt to make the entertainment value obtained through video games a global phenomenon, where people can enjoy games by competing against the best in the world. The increasing penetration of mobile games such as Clash Royale is one of the key factors driving the rising adoption of e-sports. “Multiplayer online battle arena is the leading segment of the e-sports market, holding more than 67% of the overall shares. DOTA2 and League of Legends are the highest revenue generators for the market segment,” says Ujjwal Doshi, a lead analyst at Technavio for gaming research. The constantly increasing number of players creates a steady revenue through sponsorships and advertising. One of the major factors contributing to the rapid growth of MOBA gaming is its team play element, which promotes group cohesion between the team members. All team members are important, and no weak link can escape being exploited by their adversaries. First-person shooter games dominated the e-sports market until 2012, after which MOBA games established market dominance. The intriguing gameplay of FPS games is appealing to a large number of gamers, thereby driving the popularity of the market segment. The gamer moves through the game from the first-person’s point of view, allowing them to experience an alternate personality from his real life. The appeal of first-person gaming is not likely to decline anytime soon, ensuring constant revenue generation from these FPS games. “Real-time strategy games are one of the oldest gaming segments of the global e-sports market. A unique factor about the genre that still attracts gamers is that the gameplay is not completely dependent on skill, hand-eye coordination, or speed,” says Ujjwal. The gameplay of RTS games is more dependent on strategy, where the optimal usage of available resources is crucial to a gamer’s survival, irrespective of the skill level. There is always a player who is of the similar gameplay level, but the differentiating factor will depend on how the gamer has strategized the setup against his opponents. According to the latest market study released by Technavio, the global e-sports market is projected to grow to USD 1,475.49 million by 2021, at a CAGR of more than 32% over the forecast period.